The benefits of an aluminum truck rack are great. Aluminum is a metal that has been used in the modern world because of its unique properties. It is lighter than steel yet can be very durable and provides its own protective coating that makes it resist rust much better than steel. At Magnum we use aluminum to bring you the best truck racks and truck beds on the market. Aluminum powder coated truck racks last much longer than and look much better than steel painted products. 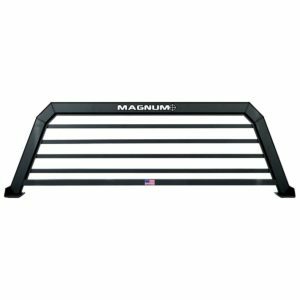 Once powder coated, a Magnum aluminum truck rack will most likely outlast the vehicle you use it on. Magnum tried and tested design after design before we reached the top quality product you see today. Our products were not created on a dry erase board with a bunch of ‘it could work ideas’. They were designed, tried and tested on the vehicles themselves, in the field in the conditions we knew they were going to be used for. The response of our customers speaks for itself. We have designs dialed in for all pickup trucks and when the new models come out, we will get on those as well. By using aluminum we are able to bring you a truck rack that helps you do the duties you need to do, have more fun all while not being too much burden on your vehicle. If you are carrying a payload or even using your truck for recreation such as hauling an ATV, the last thing you need is a heavy truck rack on your bed. The aluminum racks are still strong enough to protect your rear window from driving that ATV right through like many folks have done. We have also taken our aluminum skills to our other products such as truck beds, bed rails and rear removable truck racks.